Home :: MOTORCYCLE ACCESSORIES :: MOTORCYCLE COVERS & SECURITY :: SECURITY PRODUCTS :: CHAIN AND FRAME LOCKS :: SCOOTER/ MOPED DATATAG SECURITY MARKING KIT FOR YAMAHA, SUZUKI, KAWASAKI, HONDA, ETC. 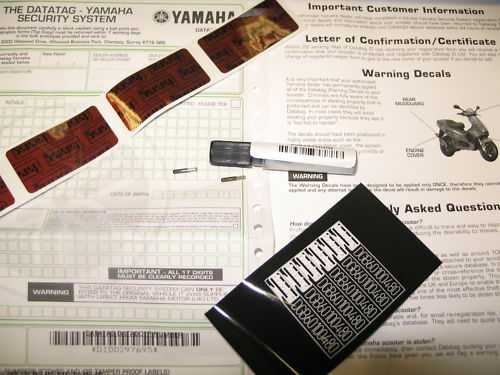 SCOOTER/ MOPED DATATAG SECURITY MARKING KIT FOR YAMAHA, SUZUKI, KAWASAKI, HONDA, ETC. Yamaha scooter security marking system (all new for 2013). Kit has x2 transponders and a tube of liquid micro dots about 2000 + 3d stickers and bar codes with other warning stickers. Full kit with easy to follow instructions. Allows police to trace your scooter if stolen even if broken up. All paper work included. Easy to register and free after purchase. The no.1 anti-theft kit in the UK! 100% successful prosecution rate over 2,500.000 sold in Europe.